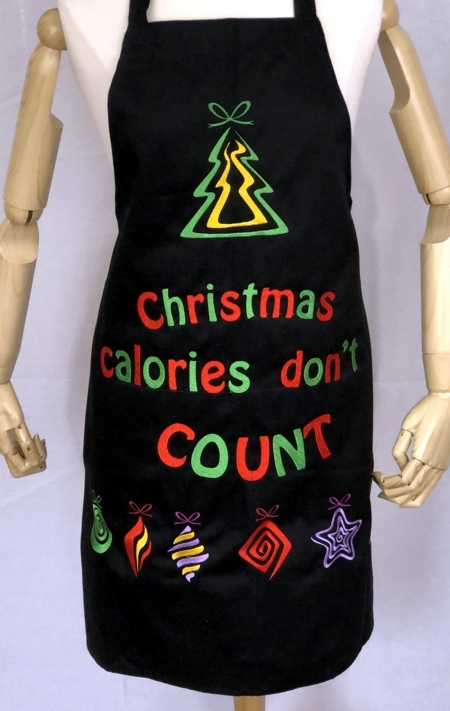 For this apron we used designs from the Christmas Tree Ornament Set and the Christmas Calories Don't Count inscription. The designs from the first set were used in both sizes, large and small. 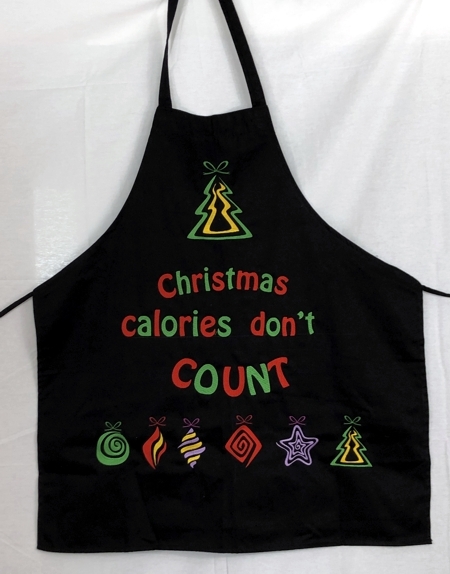 The apron makes a great Christmas gift. printer and embroidery software are helpful but not necessary. Open all the neded designs in your embroidery software on the computer. Print out templates of all designs you're going to use. If you do not have either software or a printer, make templates from pieces of paper by cutting out paper rectangles the size of the designs, and writing the name and number of the design on each piece. Press the apron. Place it on a working surface (table), right side up. Using the ruler and the chalk pencil, draw a line parallel to the hem of the apron, along these lines you are going to embroider the designs. When hooping, try to align this line with the central line on the hoop's grid. We drew the first line 5" from the hem. You may want to place the embroidery higher or lower. Lay the templates out on the apron. You can use our arrangement or make your own. We recommend to start with the designs along the hem. Here we combined 2 pictures of the finished stitch-outs along the hem. On the hem we used the designs for the small, 4" x 4", hoop. Stabilize the center of the fabric with light-weight cut-away stabilizer. Hoop it tightly. Each time, align the drawn line with the central line on the hoop's grid. Upload the files into the machine and embroider them one by one. 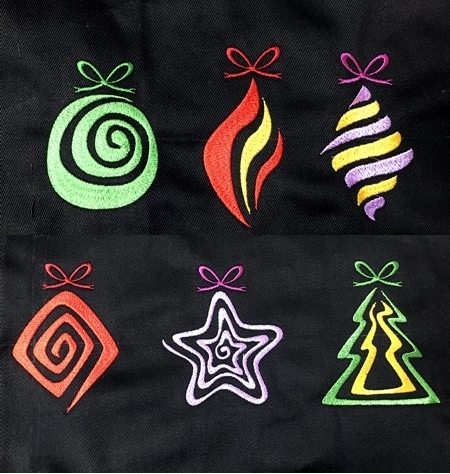 If you have a hoop 10"-12" long, you can try to embroider up to 3 designs at a time. If you do this, alway start embroidery with the middle design. Please don't forget to cut away the excess stabilizer after every stitch-out. 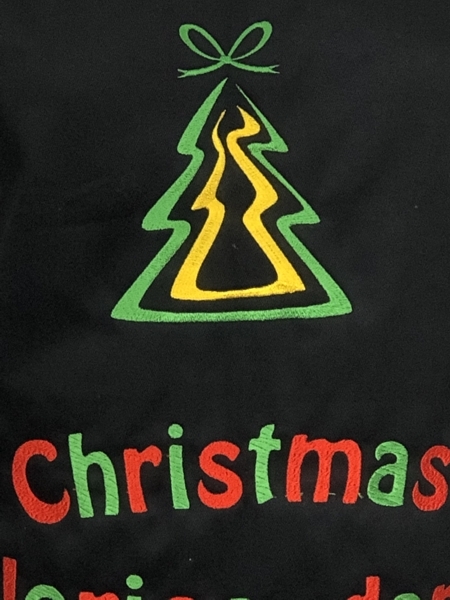 On the bib, we embroidered the tree design from the same set, but for the large hoop (5" x 7"). 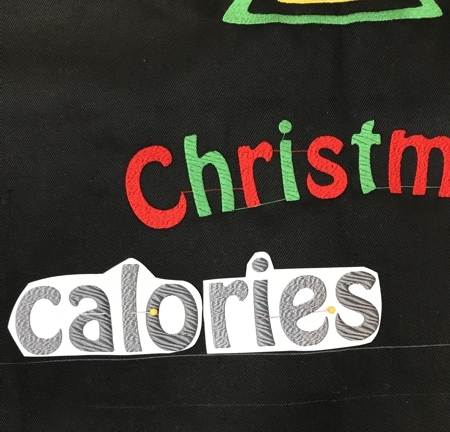 Between the 2 sets of embroidery, we embroidered the words "Christmas Calories Don't Count". 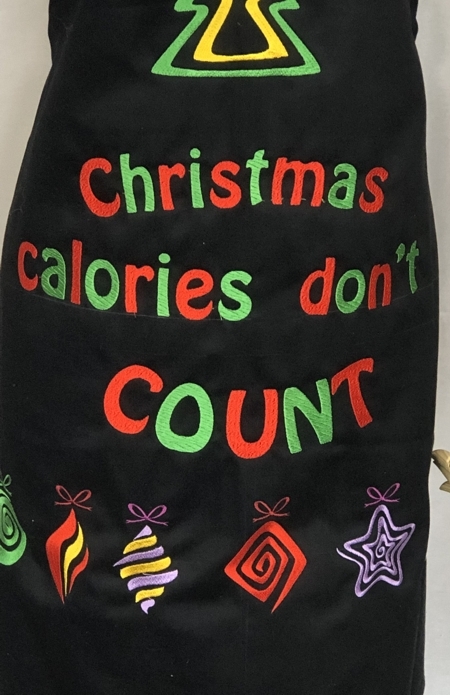 You can compose the meassage with the built-in letters or use our set, Christmas Calories Don't Count. There are 7 files, each one fits the 5" x 7" hoop. Again, draw lines parallel to the hem line and align the central line of the hoop's grid with your lines. Embroider the files one by one. Cut away the jumps. After you are done with the embroidery, press the working piece.